Putting People First is at the core of everything we do. Our singular focus is to meet the needs of our advisors and clients on a daily basis. We have a saying here at Stratos - "Our advisors and Partners don't work for us, we work for them." The entrepreneurial spirit is in our DNA. It's why we exist. And to this day, we continue to provide advisors with the resources and tools to help them become better entrepreneurs and leaders. We are committed to truly understanding the goals of our advisors and clients so that we can help them achieve their own version of success. We believe that facing challenges brings out our best -- our best thinking, our best problem-solving skills, our best teamwork. We are not intimidated by a challenge; we are inspired by it. Two heads are better than one. Ten are better than two. We believe that when we work as a team, we can achieve our loftiest goals. Be honest. Be fair. Be forthright. In our view, there’s no other way to conduct business. 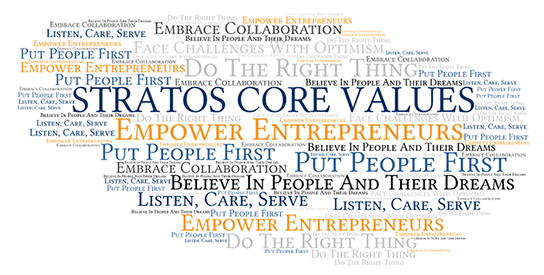 Stratos is a business founded on a dream – a daring dream. We believe that your dreams are as achievable as our own. And we will work to help you realize them.